Dubai Creek Harbour at The Lagoons involves the development of a high-end residential and leisure destination. Image courtesy of ASDA'A Burson-Marsteller. The project will also feature the world’s tallest twin towers, the Dubai Twin Towers. Image courtesy of ASDA'A Burson-Marsteller. To be built on an area of 1,482 acres (600ha), the project will consist of six residential towers that offer spectacular views of the harbor and Dubai skyline. Image courtesy of Emaar Properties PJSC. Dubai Creek Residences was the first project launched under the Dubai Creek Harbour at The Lagoons development. Image courtesy of Emaar Properties PJSC. Dubai Creek Harbour at The Lagoons is a high-end residential and leisure destination being jointly developed by Emaar Properties and Dubai Holding. It will be a modern city with world-class amenities and infrastructure spread over an area of 1,482 acres (600ha). 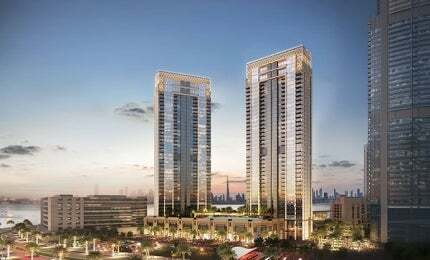 The project will consist of six residential towers offering spectacular views of the harbour and Dubai skyline. It will also feature the world’s tallest twin towers, the Dubai Twin Towers that will be developed as a mixed-use complex. The island district is being launched as part of the Mohammed bin Rashid City (MBR City) and has a masterplan larger than that of downtown Dubai. Seamlessly merging the architecture with the creek, the development promises to deliver an unmatched experience. The project will be located close to Dubai International Airport and the 25-year-old Ras Al Khor Wildlife Sanctuary. Billed as an ecologically responsible venture, it will protect the biodiversity of its location. "The island district is being launched as part of the Mohammed bin Rashid City and has a masterplan larger than that of downtown Dubai." The developers launched the Dubai Creek Residences in October 2014 as the first project under the Dubai Creek Harbour at The Lagoons development. Creekside 18 Residences, the second project under the mega development, was announced in September 2015. The development has been envisaged as inter-connected districts facing the waterfronts and surrounded by boulevards. The project will feature a central business district and a mix of cultural, commercial, technology, educational, healthcare, sporting, entertainment and shopping malls. Retail, commercial and residential zones will be built along various central parks that will line the waterfront. The amenities will be constructed along an array of lagoons and boulevards. Designed to echo the beauty of its surroundings, the Dubai Creek residences will be set upon a podium. The development will feature spacious one, two and three-bedroom residences measuring between 900ft² and 2,150ft². Set on the waterfront along the Dubai Creek, the residential block will be 40-storey tall. The façade and other features have been framed to allow the flow of natural light and offer views of the surroundings. Interiors of the residential apartments will feature stone, wood and other mineral finishing adding to the organic appeal of the structure. The luxury apartments will be adorned with sophisticated and artistic designs and mediums. The residences will be located amidst a hub of activity that includes yacht clubs, pools, world-class marina and retail outlets. Creekside 18 residences will comprise two water-facing towers that will form a part of the six-tower residential cluster. Located on the northern front, the residential towers will be 37-storey tall, featuring 480 residential units. Sparkle Towers is a luxury residential project being developed by Dubai-based developer Tebyan in collaboration with Austrian crystal company Swarovski. The towers will house one, two and three-bedroom apartments along with an additional podium level residences offering elite island accommodation. The apartments will feature floor-to-ceiling windows that allow the flow of natural light, as well as unrestricted views of the creek. The residences will be a blend of contemporary and local styles with spacious dining and living spaces. Construction will also feature a lush green landscape around a retail podium exhibiting international designer brands. Featuring high-class entertainment and telecom facilities, the apartments will also be provided with security and maintenance. Connecting to the Creek Boardwalk, the residences will be surrounded by retail, food and beverage (F&B), leisure and entertainment facilities. World-class leisure activities will be available through access to the marina, yacht club, ferry terminal creek pier, lighthouse, harbour point and other cultural amenities. Architecture firm RTKL, which is part of ARCADIS, designed the masterplan with main focus on green-blue urban planning and public space.